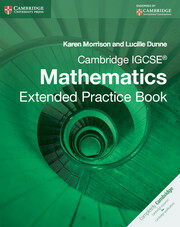 A series of titles written to cover the complete Cambridge IGCSE Mathematics (0580) syllabus and endorsed by Cambridge International Examinations. 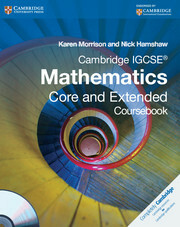 Cambridge IGCSE Mathematics: Core Practice Book offers a wealth of questions, with hints and tips along the way to reinforce skills and learning. 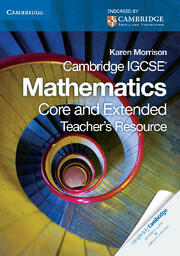 It provides comprehensive and targeted exercises ensuring plenty of practice both for the classroom and for independent learning.With concise reminders at the start of each topic, and hints in the margin, it is designed to work as a stand alone practice tool that will successfully accompany any IGCSE mathematics textbook. Those using the Cambridge Coursebook will find this a complementary asset with extra questions. 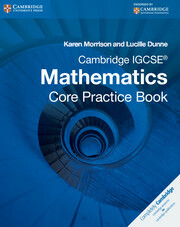 For additional exam practice, access to full exam-style papers is also available.Download two example practice papers for Cambridge IGCSE Mathematics: Core Practice Book. Emphasis is on the main two Assessment Objectives: Maths techniques (mastering maths skills through practice) and Application of maths techniques to solve problems (problem solving in real-world and mathematical contexts). Like-for-like chapter and section sequence to the Coursebook, offering targeted practice within the classroom or for home study. Packed full or interesting and progressive exercises. Summary of key points listing what students need to know to do the exercises. Hints and Tips to offer support along the way.